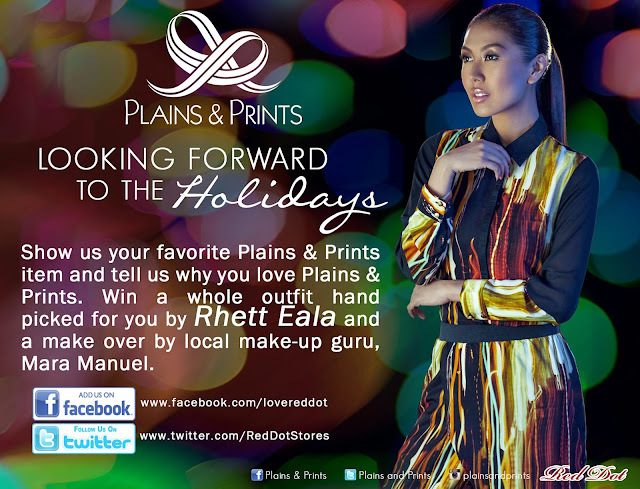 You could be one of the two lucky winners to win an outfit styled by Plains & Prints Creative Director and designer of the stars: Rhett Eala + a make over by our very own ilocana make-up artist, Ms Mara Manuel! Upload a photo of you in your favorite Plains & Prints item on facebook and complete this sentence “I love Plains & Prints because….”. You can also do the same on twitter, mention @RedDotStores with #ILovePlains&Prints. 1) This promo is open to anyone who has a Facebook account and a Twitter account. 2) Upload a photo of you in your favorite Plains & Prints item and tell us why you love Plains & Prints. 3) Share and link the photo on your wall. 4) Announcement of winners will be on November 5, 2012. 6) Winners will be notified via email, Twitter and Facebook announcement. The mechanics are a piece of cake so there's no reason you can't send in your entries girls! Don't forget to like, tag, and follow Red Dot in facebook and twitter in all of your entries to make sure you'll be spotted!